This exquisite dining table features four beautiful turned legs reminiscent of embossed ribbons. The edge features beautiful serpentine ornate engravings, creating this phenomenal and breathtaking dining table. Match this dining table with the Dining Arm Chairs or Side Dining Chairs to attain the look shown here. Perfect for any fine dining room. These fabulous chairs features beautiful turned legs, reminiscent of wrapped ribbons. The attractive embossed flowers on the exposed wood base board and the serpentine scrolled arms create a breathtaking effect. The patterned fabric and crowned back complete these exquisite Dining Chairs. Combine this fantastic Dining Side Armless Chair with the Armless Dining Arm Chair and Rectangular Leg Table for the complete look shown here. The North Shore Rectangular Extension Table and Dining Arm Chairs / Dining Side Chairs Set by Millennium at Turk Furniture in the Joliet, La Salle, Kankakee, Plainfield, Bourbonnais, Ottawa, Danville, Bradley, Shorewood area. Product availability may vary. Contact us for the most current availability on this product. Handles & Hardware Flower-like hardware appear throughout. Case Detail Turned legs and wood detailing on exposed wood arms, base boards, bed posts, and mirror frames appear throughout this collection. 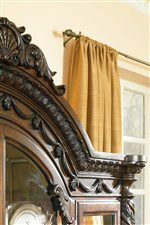 The North Shore master bedroom and dining room collection features beautiful turned legs, half turned posts, embossed flowers and leaves, and intense ribbon-like detailing on the exposed wood and casegood pieces for an Old World atmosphere. 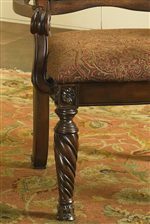 The North Shore collection is a great option if you are looking for Traditional furniture in the Joliet, La Salle, Kankakee, Plainfield, Bourbonnais, Ottawa, Danville, Bradley, Shorewood area. Browse other items in the North Shore collection from Turk Furniture in the Joliet, La Salle, Kankakee, Plainfield, Bourbonnais, Ottawa, Danville, Bradley, Shorewood area.